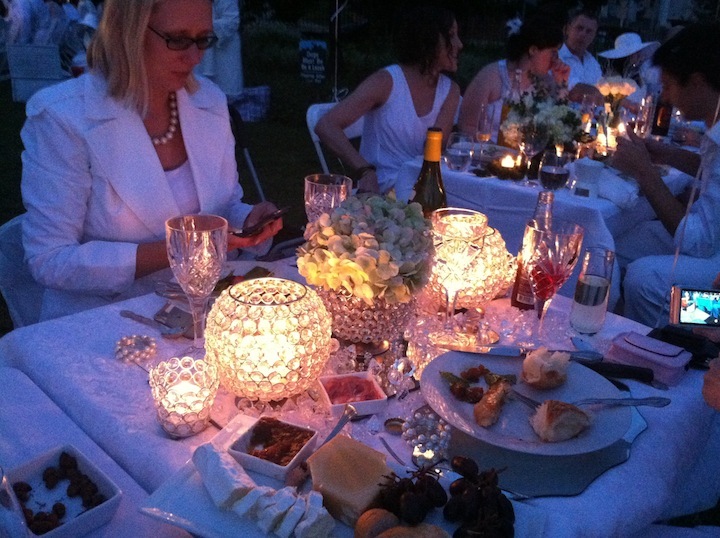 Diner en Blanc. An event that started with a group of friends in Paris 20-plus years ago has turned into a global gathering, and I was lucky enough to attend Cincinnati’s first pass at it. 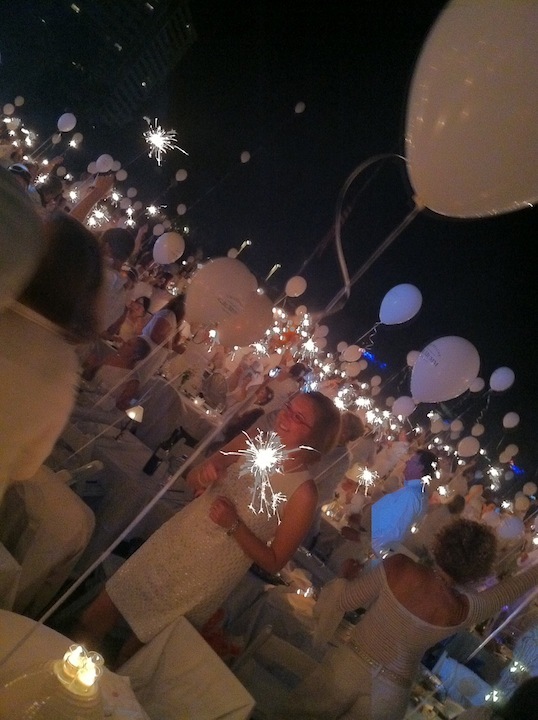 A very glamorous flash mob…wearing all white and taken to a secret location, you bring the party with you. Literally. 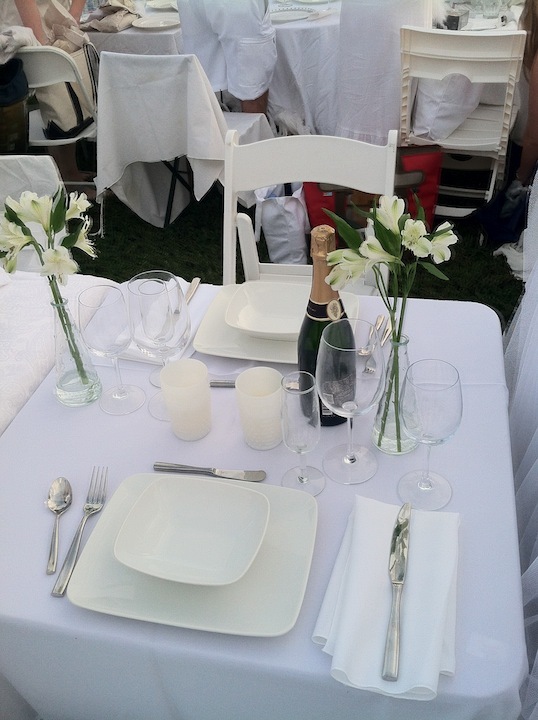 White table, chairs, linens, china, glasses; everything you need to set a lovely table. And the food, and wine, of course. It was really fun to see all of the creativity and effort people put into their settings; I went a bit sparse and modern, but was totally comfortable with that. I didn’t know what to expect, and it was a lot of work to get things together, so it was all about being super simple. Next year…the sky is the limit. No real recipe needed here. 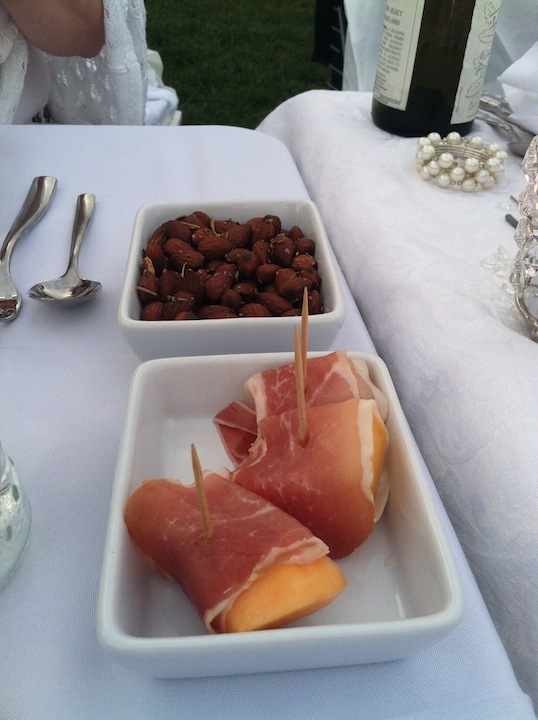 Wrap the melon of your choice and shape (slices, wedges, cubes) in prosciutto. Drain and rinse the beans completely; add them along with the vinegar and olive oil to the onion. Blend until you have a smooth puree. Served with a lovely French white wine. Had just a few selections – mostly Spanish. 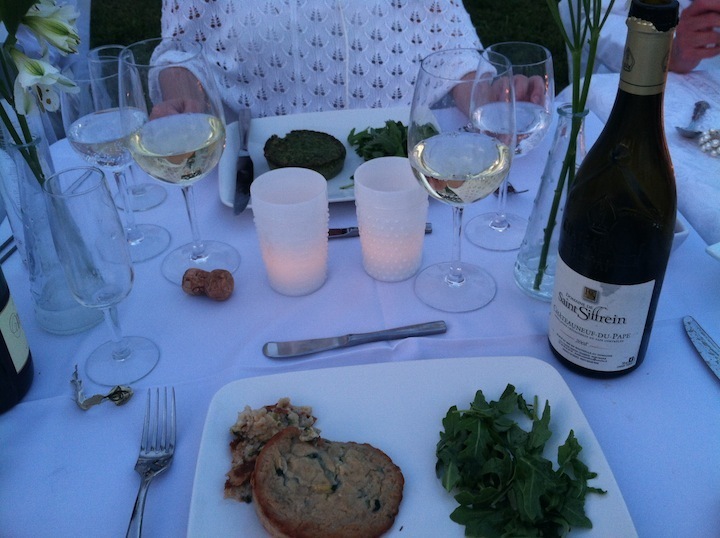 By this point, I no longer knew what wine I was drinking…but it was good. We were having too much fun to remember to document the food…our neighbors were awesome. We were super lucky to be sitting next to them. The original recipe is for cardamom cookies with an orange glaze, which I skipped for the evening. So good, even without it. Brush molds of a madeleine pan with butter; set aside. Make the batter: Melt butter in a small saucepan over low heat. Remove from heat, and stir in honey and vanilla. Let cool 10 minutes. Whisk flour, baking powder, cardamom, and salt in a small bowl; set aside. Preheat oven to 325, with rack in center. Stir together sugar and eggs in a medium bowl. Gently fold in flour mixture until combined. Add butter mixture, and fold until combined. Cover with plastic wrap, and refrigerate 30 minutes. Spoon batter into prepared pan, filling each mold halfway. Tap pan on work surface to eliminate air bubbles. Bake until cookies are puffed and edges are golden, 7 to 8 minutes. Transfer pan to a wire rack; let cool slightly. Unmold cookies onto rack, and let cool completely. Balloons! Sparklers! Wine! Dancing! A truly memorable evening; I cannot wait until next year. looking forward to doing it again next year! What a great post! I loved this! Looked like it was so much fun! I am so impressed. I had never heard of this dinner before! 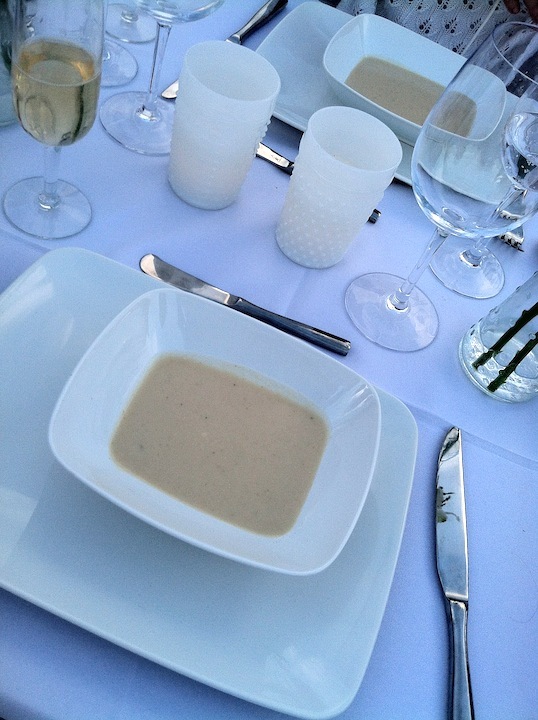 Loved your table setting – and your menu – what a fun night!